A slice of this vintage sour cream pound cake recipe is the most moist slice of cake that you would every want. I am topping each slice with a nice raspberry sauce making it a very special dessert. Our family vintage recipe came from my Mothers recipe notes, she loved a great pound cake and this one was one of her favorites and one of mine. 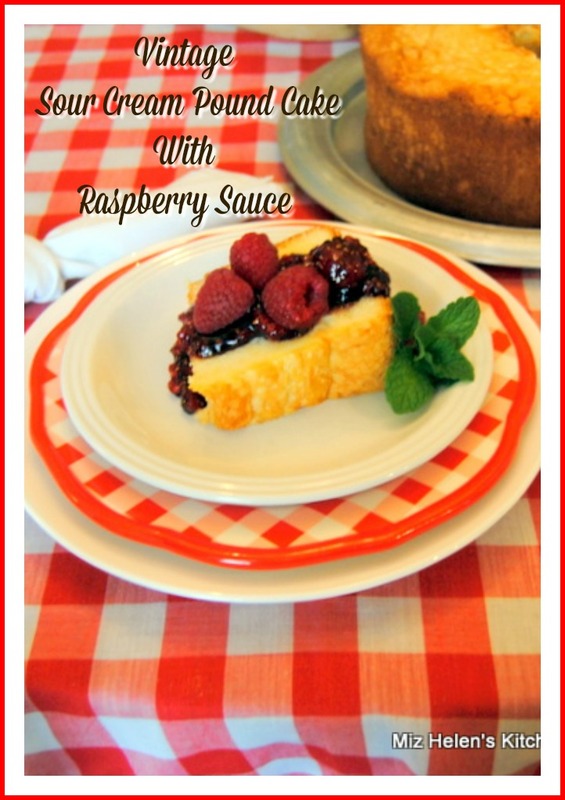 The raspberry sauce can be served drizzled on top of the cake, it is just delicious! In a mixing bowl, cream the sugar and butter until it it very creamy. Separate the yolks from the white's putting the whites into a separate mixing bowl. Add the yolks one at a time beating after each addition. While the mixer is running, add the vanilla, lemon juice and the sour cream, beat until well blended. In a medium mixing bowl, sift together the flour, salt and soda. Add the dry ingredients into the batter and beat until incorporated. Fold the beaten egg whites into the cake batter. Spray a tube pan with a flour and oil baking spray. Pour the batter into the tube pan and bake at 300 degrees for 1-1/2 hours. Remove from the oven and let cool on a rack for 10 minutes, then remove from pan. Pour the Raspberry Jam, and water into a saucepan. Heat the mixture until the jam is melted and a sauce consistency. Stir in 1 cup of the fresh Raspberries and cook the mixture on medium heat for 5 minutes. Remove from the heat and let cool before serving. Use the remaining Raspberries to garnish the sauce. For All The Family and Friends To Enjoy! We Are Ready To Serve This Cake! This Slice Is For YOU! I sure appreciate you stopping by today and to enjoy this vintage dessert with us. We love having friends at our table and always look forward to your visits. Hope you have a great week and come back to see us real soon! Does that recipe for the vintage pound cake ever sound good, Miz Helen. You had me at raspberry sauce...swoon! I love your late MIL's vintage cake plate and cover. What wonderful cakes it must've held and still does! Your table looks so pretty with the checkered plates and checkered cloth. Miz Helen, your tablecloth reminds me of one my late Mom had, and that I have now. She always used it when we had spaghetti, and it has some very special memories attached to it. Love your mother in law's beautiful cake dish and cover and your cake from your Mom's recipe looks amazing. There is nothing like a good vintage pound cake! Sharing later today on the Hearth and Soul Facebook page. Thank you so much for sharing. I hope your week is going well. My family loves pound cake. They will be very excited when I surprise them with this! Hi again, Miz Helen! I just wanted to let you know that I'm featuring your lovely pound cake at The Hearth and Soul Link Party this week. Hope to ‘see’ you there! Have a wonderful week ahead! YUM! I really enjoy pound cake, especially with berries! Miz Helen, I am sorry for not joining your party...It was always my favorite, I think. When Bill passed, I just lost it...I didn't post for awhile...then, slowly, I got back in. I just haven't had much interest in joining parties...with blogging, Facebook, Pinterest and IG, it's just keeping me busy. Just wanted you to know this.